Abstract: Nelson Rolihlahla Mandela's death on 5 December 2013 and his funeral ten days later were taken as an occasion in the global media to discuss the merits of political leadership for human security, with occasional comments on its pitfalls. This particular leader is not the most politically safe object of discussion, as, for a long time, he openly advocated civil disobedience and resistance, initially of the non-violent kind, but later becoming violent. Predictably, the local hegemon reacted with great brutality and sweeping measures to the resistance of the ANC, policies that shocked many in the western world. This reaction by the gov­ernment and its supporters and the counterreaction it incited amounted, in the long run, to little more than a vast reduction in human security for most citizens of South Africa, lasting until the ANC's victory and Mr Mandela's ascendance to the presidency in 1994. Abstract: The growth of social enterprise within development NGO work might lead one to suspect it has been irredeemably corrupted by neo-liberal capitalism. However, using the tools of capitalism is not the same as subscribing to the values of capitalism. This paper is situated at the intersection of five fields: human security, international development, social enterprise, social franchising, and left-wing anti-capitalist thought. It examines the relevance of social en­terprise to human security and to development, the relationship between social enterprise and the anti-capitalist values of the left, and it then focuses on social franchising—a subset of social enterprise that highlights the importance of cooperation—suggesting that it may be a useful methodology for NGOs carrying out educational work in parts of the developing world. It syn­thesises and extends ideas that I have presented elsewhere [1-3], it draws on ethnographic fieldwork on the Thai-Burma border, and it puts forward an agenda for further applied research that is rooted in a sociological analysis of civil society and contributes to the human security paradigm. Abstract: Alexander and Sabina Lautensach (editors) propose that their book is primarily intended for students and for teaching, and that a pedagogical approach was prioritised rather than a reproduction in the standard format of an academic monograph (p. XVII). Throughout, they aim for a diverse, multi/trans-disciplinary approach in content and presentation by contributors with potential student outcomes focused on flexibility and a broad spectrum knowledge and understanding of human security. To these ends they have been very successful. This hefty tome, almost encyclopaedic in its scope and depth, needs to be approached by students in a certain way. That is, students will benefit from some directed guidance regarding approach and methodology in order to successfully navigate through the many detailed concepts, theories and practicalities contained in the book. This is clearly provided in the preface where the authors spend quite some time outlining the rationale of the book in a simple and easy to understand way that will be particularly useful for students and other engaged readers. Abstract: Timor-Leste is a very young and developing nation state. Endemic infectious disease and weakened health security coupled with its growing and inclusive public institutions keep Timor-Leste fragile and in transition on the spectrum of state stability. The objective here is to systematically review Timor-Leste's state and public health successes, showing how a fragile state can consistently improve its status on the continuum of stability and improve health security for the population. The case study follows a state case study approach, together with a disease burden review and a basic description of the health portrait in relation to Timor-Leste's fragile state status. Disease burden and health security are directly proportional to state stability and indirectly proportional to state failure. Timor-Leste is a clear example of how public health can feed into increased state stability. Our discussion attempts to describe how the weak and fragile island nation of Timor-Leste can continue on its current path of transition to state stability by increasing health security for its citizens. We surmise that this can be realized when public policy focuses on primary healthcare access, inclusive state institutions, basic hygiene and preventative vaccination programs. Based on our review, the core findings indicate that by increasing health security, a positive feedback loop of state stability follows. The use of Timor-Leste as a case study better describes the connection between public health and health security; and state stability, development and inclusive state institutions that promote health security. 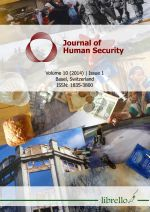 Abstract: This article attempts to explore and analyse the evidence for cohabiting the human security concept into the national security frameworks of ASEAN countries. Using the Philippines and Malaysia as case studies, the article determines the extent to which public officials and policymakers have redefined and reenvisioned national security by incorporating non-traditional, people-centered elements of human security. The word 'cohabitation' refers to national governments' efforts to amalgamate statist and humanist dimensions of security when articulating and implementing their national security rhetoric and agenda. It argues that human security naturally complements state security, and vice versa. As such, human security and state security co-exist in a constructive manner that enhances the overall level of national security. In other words, they are mutually constitutive rather than mutually corrosive. Both cases underscore a two-pronged assumption. First, the meaning and provision of national security can neither be eloquently articulated nor completely substantiated without considerations for 'below the state' actors and issues. And second, the eminent status vis-à-vis power of the state in providing national security can neither be trivialized nor undermined. Abstract: The last two decades were characterized by severe conflicts in the West Africa subregion. The era of conflict resolution, management and peace building thus came to define theregion. The destruction left by long years of protracted conflicts and the present state of devel opment is reason enough to warrant attention both from within and beyond. The study expounds, operationalizes and clarifies the concept of human security and development, and how human security issues lead to underdevelopment. The paper investigates the human security concerns in the post-conflict period and also looks at the crisis of development in the sub-region. It highlights details on the developmental crises that have bedevilled the sub-region and at the same time exposes the threats these crises pose on national security and peace in the subregion. This paper concludes that there is no appreciable effort in operationalizing human security in West Africa and this will lead to instability. The paper maintains that human security issues now complicate the developmental crisis in the sub-region due to its ambiguity. The paper suggests that policy makers should address human security issues in order to tackle developmental crisis in the sub-region. Abstract: This study examines the disjuncture between the policy transposition of the Liberal Peace Project (LPP) in South Sudan from the country's local context. It underlines how deep rooted historical exclusion from social welfare services reinforces political exclusion and exacerbates poor civic engagement among different ethnicities in the country causing a constant relapse to violence. The study combines a qualitative review of data from Afrobarometer, the National Democratic Institute, international NGOs, and South Sudan's government reports within depth interviews and participants' observation. The research finds that restricted access to formal education alongside the conservative and orthodox approaches to peacebuilding, which broadly focus on centralised urban political institutions and exclude diverse local needs and preferences, limit citizenship participation to elections and preclude an equitable social order in South Sudan, establishing a continuum of fragile authoritarian peace, institutional peace and constitutional peace. In an emancipatory approach, the study proposes a framework that prioritizes an extended access to primary and post-primary vocational education as a more credible establishment for sustainable civil peace in the country. The LPP by the international community needs to be tailored to enhance the political will of the South Sudan government to extend free primary education access, incentivize primary education with school feeding programmes and to invigorate vocational training curricula. These will yield civil peace dividends, which avert South Sudan's structural source of relapse into violence with sustainable disincentives. Apart from women's empowerment through education and in all spheres of life, the government needs to ensure sustainability by guaranteeing a sustainable future for the present and for returning refugees by reducing the effects of climate change so as to cope with the increasing pressure on natural resources. Abstract: East Asia (including Southeast and Northeast Asia) has witnessed the most spectacular pacification in the world during the past 30 years. Certain dimensions related to human security have been perceived as weak points in the long peace of East Asia. Despite progress, authoritarian violence is still a reality in East Asia. At the same time, certain other dimensions of human security—most distinctively those elements related to "freedom from want"—have developed very well during the long peace of East Asia. This article will study whether the concept of human security constructs realities that are useful for peace in East Asia. For this, the article will look at how the way in which "human" and "security" are linked, serve and deepen the existing social realities of peace in the region. Furthermore, the article will look inside the concepts of "human" and "security" to see how human security is constructed and whether the construction serves to deepen the long peace of East Asia. The article will argue that the East Asian human security debate could be an intellectual adaptation strategy useful for the promotion of the long peace of East Asia in a deeper sense.